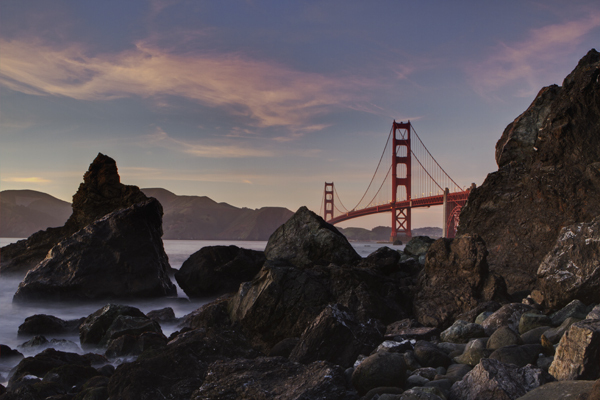 My obsession with Golden Gate Bridge photos continues in today’s “art of transit” with this lovely image by Kevin Ash (check out his photography website, which focuses on aviation). I like the image because the bridge is crucial to the photo yet only occupies a small fraction of the frame — instead the viewer is given a splendid view of the bridge’s habitat. The photo was taken with a Canon EOS 7D and exposed with a shutter speed of 3.2 seconds, f/22 aperture, 24 mm focal length and ISO of 100. Flash was not used and the image was processed in Photoshop.